There’s no better way to say it – eReaders have changed the way we read. The convenience of having every book in your collection at your disposal has made people flock to these handy gadgets in droves. Plus, you can download the latest best seller in seconds, usually for cheaper than buying it in print. Prices drop more and more every day because publication companies are being forced to compete. Add to that the privacy of eReaders – no one has to know that you’re reading Fifty Shades of Grey – and it’s no wonder these devices are flying off of shelves. However, budget tablets like the Kindle Fire HD and Nexus 7 are inching ever closer to e-reader price. Smartphone screens are ballooning out and 4 and 5 inch displays have become the norm. Since both of these gadgets can be used as eReaders, it makes people think twice about an eReaders value. Companies that produce eReaders are now faced with an interesting question from the consumer. If I can read ebooks on any gadget, and gadgets that do more than eReaders only cost a few dollars more, why should I buy an eReader? Here are some tricks the latest eReaders could have up their sleeves to keep consumers excited. These features could keep eReaders from going the way of the pager and PDA. A great battery has always been one of the huge selling points of eReaders. With battery life measured in days and weeks instead of hours like smartphones and tablets, eReaders have cornered the market on convenience. If the Kindle Paperwhite is any indication, it seems like this will remain major selling point. Amazon was able to cram a frontlit screen and other nifty features into this gadget, while still keeping the same battery life as the Kindle Touch. That’s impressive. Even more impressive is how powerful batteries in mobile devices are becoming. As smartphones and tablets become even more powerful, they require stronger batteries. That technology can only benefit eReaders. Expect to see eReader batteries continue to grow. This will mean either more time between charges or the ability to add new features without sacrificing battery life. Some eReader manufacturers are trying to ditch chargers altogether. Solar power seems to be the next frontier for eReaders. Solar would allow eReader manufactures to be able to market their gadgets as never needing a charge. While this isn’t really true, solar cells could add weeks to the already long life spans of eReaders. That would make these gadgets the perfect travel companion – no need to pack extra cables! Amazon and other companies could market their gadgets as “green” gadgets, as well. That, combined with perceived savings from reduced energy consumption, can only increase eReader sales. Right now, there are only two devices to point to in the field of solar: the Toshiba Biblio Leaf and an unnamed LG prototype. However, the advent of solar charging cases (which are currently available for several Kindle models) proves that there is a demand and that companies know it. 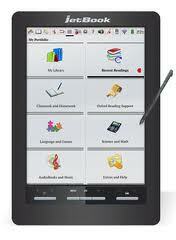 We could see this in eReaders by 2013 or 2014. A company that isn’t already a big player in the eReader market could grab a significant slice of the market if it can rush one of these out. Expect LG or another big tech company to try it for either back-to-school season or Christmas. One of the biggest knocks on eReaders is that they don’t “feel” like reading a book to purists. Many people who stick to print books do so because they love feeling the crease of a book resting in their lap. Right now, there are no screens that are able to fold in half the way a book would. There are screens that can roll the way a newspaper would, though. These could one day lead to a digital newspaper that could refresh daily. No more fetching the New York Times from the lawn in your robe! However, it will still be a while before this science fiction becomes science fact. 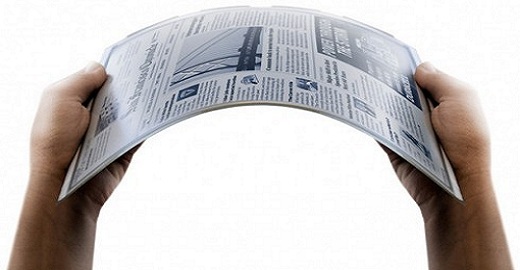 Flexible LED screens are incredibly expensive to produce. Manufactures will stick with cheaper display technology for a while, but they could become cheap enough to produce near the end of the decade. When they are, expect eReaders that are incredibly thin and much more durable. While purists won’t be able to fold their eReaders any time soon, they may be able to enjoy glossy magazines and newspapers. Color e-Ink will have the same readability as regular e-Ink once it’s perfected. Though Amazon CEO Jeff Bezos is on the record saying this technology “isn’t ready for primetime”, it’s really close. Xerox has already displayed prototypes of a gorgeous color e-Ink screen andJapanalready has a few available. The only eReader currently available with a color e-Ink screen is the ECTACO JetBook Color, but that is a 9.7” form factor, perfect for text books and newspapers, but a bit big for reading normal novels on. The technology to get color e-Ink into smaller 6” models is available, but still a bit expensive; expect to see this technology hit in 2013. There is however a rumor that Barnes & Noble could be refreshing their models in late 2012 for a holiday launch, so it could be even sooner. The one thing holding back color e-ink readers are frontlit displays. These LED displays have a similar comfort to e-ink readers but can be much higher resolution. This is achieved by layering the display for all the benefits of LEDs without any of the eye strain. Since Amazon and Barnes & Noble are both relying on this technology in their latest models, it could be the way the rest of the industry goes. There could even be a big rivalry between the two technologies, like there are between Android and iPhone users. 3G cellular data is already a reality in many eReaders. However, 4G LTE, which offers speeds faster than many home Wi-Fi connections – hasn’t even appeared in very many tablets just yet, let alone eReaders. However, cellular carriers are adding more 4G cities each year. Verizon has more than 100 cities, with AT&T and Sprint adding new cities each month. As more and more cities go online with 4G LTE, it’s only a matter of time before someone adds the feature to an eReader. Expect to see a 4G LTE eReader on the market in 2014 or 2015. However, it’s probably not going to be as affordable as other eReaders when it’s first released. You’d probably need a costly data plan to connect to it, as well. If you want free 4G LTE the way some eReader makers give out free 3G, you’ll be waiting for a while. 4G LTE deployment might not be strong enough or widespread enough to support that until the next decade. Cloud – or Web-based – storage has been the holy grail of smartphones and tablets. It allows you to keep a ton of media online so you don’t need a huge amount of storage on your gadget. This means gadgets can be thinner and lighter while still being able to access all of your files. One thing to keep in mind is that this isn’t terribly necessary in eReaders. While movies and music files can clog a memory card, most eReaders can hold thousands of ebooks. Some are even able to support expandable memory through SD or microSD cards. That being said don’t be surprised to see this in the near future. Amazon already has cloud storage with the Kindle. It could help sway some buyers who purchase a lot of digital media. This seems like an obvious addition, but it’s been a non-starter. Print publications haven’t jumped at the opportunity to play nice with digital gadgets because they think it will lose them money in the long run. That being said, this is already being planned on smartphone and tablet apps like Zinio. It’s only a matter of time before publications warm up to delivering their content to eReaders directly. As journalism continues to struggle, we could see all sorts of exclusive deals to publish on eReaders. As for auto-delivery of magazines, it’s a toss up as to when it will be available on all eReaders. The ball is firmly in the publications hands. It could still be a long time before they warm up to the idea of giving out there content at the low price it would require. Though eReaders are awesome for quick highlighting and finding text, detailed note takers have had to suffer. Writing in the margins or doing annotations is still something that is exclusive to paper texts. However, students have been clamoring for the ability to take margin notes in eBooks. It makes them stick to paper more often than not. Since students spend $1000 or more each year in books, it makes sense that it would pay to make students want to go digital. It would be difficult to pull off but not impossible. Though no companies have announced this feature in a model, it’s enough of a game changer to expect it at any time. There are dozens of other potential features eReaders could add, but these are the most important. With eReader sales expected to taper of in 2014 and 2015, these additions could save the gadgets from being more than a novelty item. Of course, there’s always the chance eReader could add more features that resembled smartphones and tablets to compete. Time will tell if eReader manufacturers choose to live in their niche or become hybrid gadgets. Either way, eReaders will stand the test of time. As long as they give publishers and readers a more rapid way to connect, people will continue to buy them.